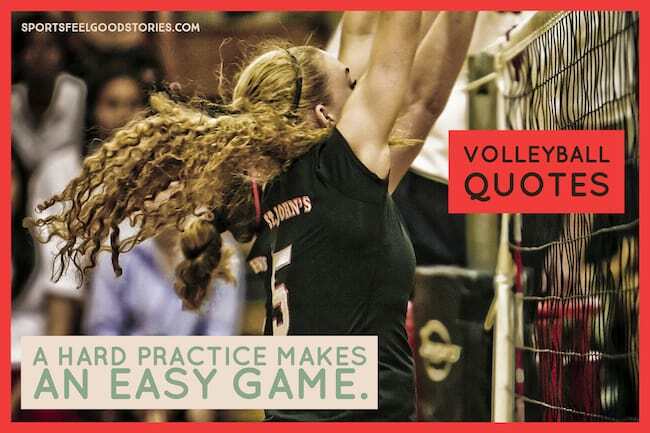 Our favorite collection of volleyball quotes for players, fans and coaches curated from a variety of secondary resources. We’ve set you up with some lists that are here to motivate, inspire and entertain. Click on any of the topics listed to jump immediately to that section or just scroll down slowly. If it’s worth it, then you do it. Breathe, believe, and battle. My former coach, Troy Tanner, told us that before each match. Breathe – be in the moment. Believe – have faith that you can rise above it. Battle – you gotta be prepared to go for as long as it takes. There is pressure on every play. You can’t make a mistake, but that also means your opponent can’t make a mistake. It makes the matches more exciting to watch. Serving plays such an important role in the game. If you serve well, things usually go well for your team. 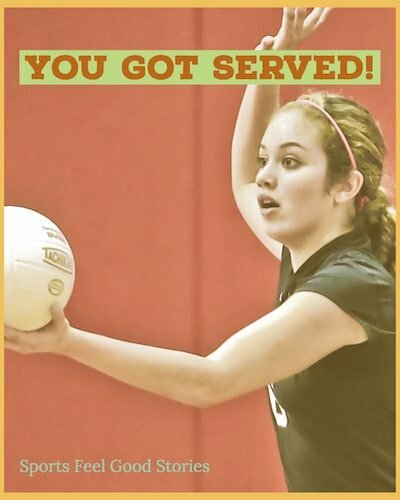 Playing off the double entendre associated with subpoena servers, this quote about volleyball serves notice that your server is one to reckon with. 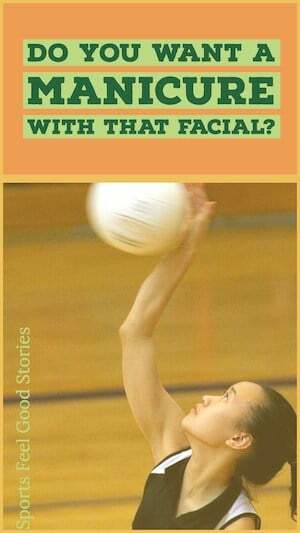 This is a whimsical quote about volleyball that usually can’t help but generate a chuckle or two. 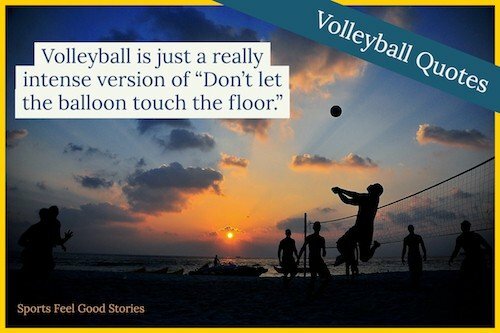 Who hasn’t played the “Don’t let the balloon touch the floor”? 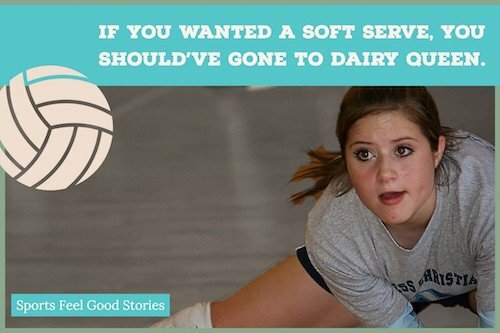 If you wanted a soft serve, you should’ve gone to Dairy Queen. Who is noted for their soft serve ice cream? Duh, Dairy Queen! Do you want a manicure with that facial? 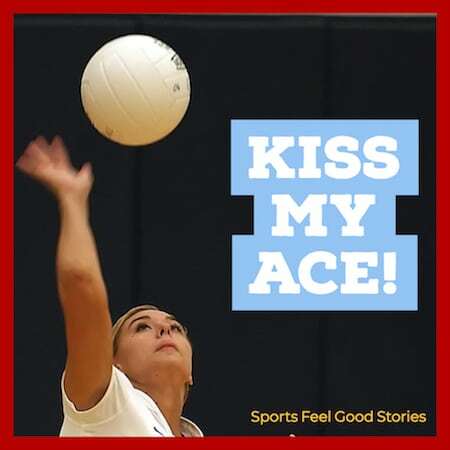 Here’s an in-your-face volleyball saying that serves your opponents notice that you’re not here to mess around. Ok, let’s face it, you probably don’t want to say this to anyone except a fellow teammate. 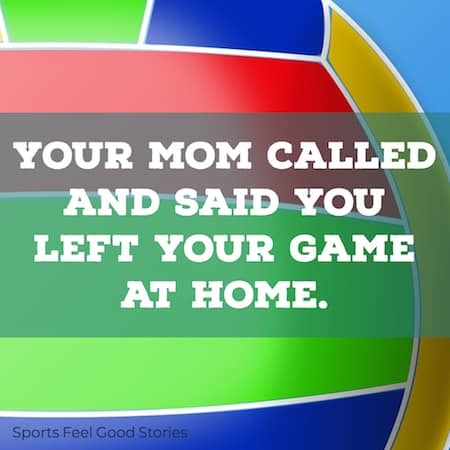 Your mom called and said you left your game at home. Turn up your talking smack game. Remember, use this saying with care as you won’t make me friends tossing off comments like this. This is trash talking at its best or worst depending on your perspective. Again, probably best used with someone you know who can take a joke. A hard practice make an easy game. Bump, set, spike it — that’s the way we like it. A simple formula for success in volleyball. Plus, the rhyme holds it all together. Who cares if “pass” and “hit” are the preferred terms? If you’re dating a volleyball player, raise your glass. If you’re not, raise your standards. I’m so good, your mom cheers for me. Volleyball: More than a sport – it’s a way of life. Even Cinderella can’t get to this ball. There’s no elevator to the top, take the stairs! The setter, a hard working, talented volleyball player who receives NO GLORY! You didn’t lose, you just ran out of time. You know an ace more than a card. Sore or sorry? You pick. Volleyball season is every season. If you want a soft serve, you should’ve gone to Dairy Queen. Life is better when I’m digging and passing. You know you’re a setter when your wrists turn red from bumping so much. What all good spikers know: Thank your setters! Love me, I’m a setter. You know your a setter when no one understands how difficult your job is. Why did the setter cross the road? To get to the shanked ball. I still get excited just attending a final four, because the process is so long, so arduous, so challenging, that when it finally arrives, the adrenaline can’t help but take over. I love the sense of accomplishment and camaraderie that the indoor game can engender. 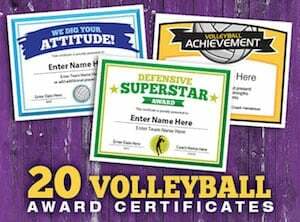 Check out our 20 Elite Volleyball Certificates. I never did. I only prepared to win the next day. It’s hard to give a career like this up, when I tell my wife I’m going to the office, and it’s the beach. Don’t ever let the ball hit the ground without a body hitting the ground with it. A great defensive play is worth about five points in emotion. Don’t fire your opponents up. If they’re down, don’t tick them off. Let them stay down. Volleyball is the sport through which I am able to express my God-given talents of being an athlete. It is a sport which involves relating, pushing, and encouraging your teammates. It has helped evolve me into the person I am today. The best passing drill is pass-set-hit. The best setting drill is pass-set-hit. And, the best hitting drill is pass-set-hit. Anything less than a game situation, unless very well planned, has the possibility of introducing artificial situations, and complete transfer to the game might not occur when drills are constructed in this manner. To be true to one’s self is the ultimate test in life. To have the courage and sensitivity to follow your hidden dreams and stand tall against the odds that are bound to fall in your path. Life is too short and precious to be dealt with in any other fashion. Volleyball rules are simple. If it is on the floor, pick it up and get it into the air. If it is in the air, keep it off the floor. I didn’t get into this to pick up a new hobby, I don’t want to be a golfer. I want to be the best. I think any time people behave in a way that’s truly them, then they never fail. You get in trouble when you try to copy others. There are a lot of people out there who would love to trade spots, so I have nothing to complain about. but we are spread pretty thin. People don’t see that. Sometimes they thin we just come here and play volleyball. In the beach volleyball world, every major decision goes through Karch. He is the Obi-Wan Kenobi of the sport, the Jedi Master of the sand, reminiscent of the wise, exalted character in the Star Wars universe who teaches Luke Skywalker the ways of the Force. He’s all-knowing, all-seeing. Was I the only person who wasn’t exhausted after the gold medal match? Was I the only one who wasn’t blubbering away? Sheesh. For once, I bet I was more amped up than Kerri. I was flying high, floating on a cloud, living life at 310 percent, with an angel on my right shoulder. …Olympic gold medals aren’t about the awards; instead, they’re all about the rewards. I want to spend the rest of my time on earth experiencing the gifts of my Olympic gold medals, connecting and building relationships with others, and sharing and expanding upon their strength, power, beauty, and majesty. Unlike the somewhat well-known name of James Naismith, who invented basketball, volleyball’s creator has enjoyed a much lower profile. Read on to find out more. William G. Morgan was the inventor of volleyball. A native New Yorker, Morgan met James Naismith, the inventor of basketball, while studying at Springfield College. The game was originally called Mintonette, which is a derivation of badminton. While working at a YMCA, he noticed the game of basketball favored the more athletic and that some folks had a hard time getting up and down the court quickly enough. His desire was to create a game that anyone could play, despite their age or athletic ability. In the winter of 1895, William G. Morgan developed the game Mintonette, that became known as volley ball, and then ultimately, volleyball (one word). Morgan was a YMCA physical education director in Holyoke, Massachusetts when he invented the game. In search of an appropriate game, tennis occurred to me, but this required rackets, balls, a net and other equipment, so it was eliminated, but the idea of a net seemed a good one. We raised it to a height of about 6 feet, 6 inches (1.98 metres) from the ground, just above the head of an average man. …content in the knowledge that the game brought a richer life to millions of people throughout the world. We needed a ball and among those we tried was a basketball bladder, but this was too light and too slow. We therefore tried the basketball itself, which was too big and too heavy. I assume that most people know that I’m a volleyballer of some renown. In fact, for a long time, volleyball became as big a part of my life as basketball once was. The man who won’t loan money isn’t going to have many friends – or need them. I started playing volleyball very late in my athletic career, around the age thirty-three or thirty-four, but I became quite proficient. It’s a highly skilled and very fast-paced game. Being able to hold my own against the best in the world, on the beach or indoors, is something I’m very proud of. 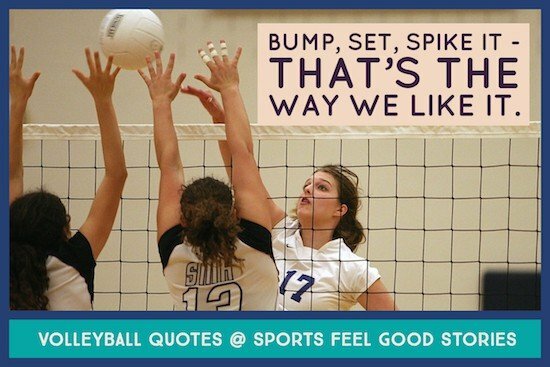 Tip: Use these volleyball quotes for photo captions, locker signs and inspirational notes to players. Whether you’re a middle hitter, a setter, a libero, spiker, coach or fan, we hope you enjoyed the collection above. 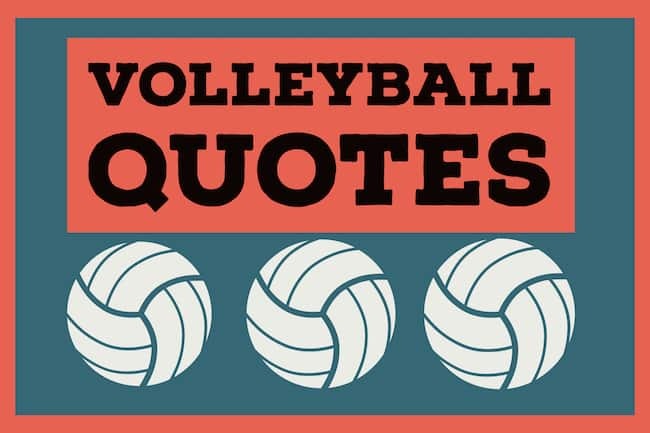 1 – Volleyball Quotes – You’re Here!